Dr. Paula Mckeehan and her students of the wildlife, sustainability, and ecosystem sciences department introduced a new way to bring healthy foods to Tarleton State University that will benefit students by teaching and feeding them. Their solution was the “Sustainable teaching garden project.” The garden that is located behind the Fine Arts building began in 2014. They used the space behind the building to set up empty beds, and the garden has been an ongoing project with the department since then. “We want students to come help with the produce and be educated on how it grows,” said Mckeehan. The group grows vegetables such as lettuce, tomatoes, onions, and potatoes. They even grow mint leaves and herbs. Mckeehan uses those same plants and produce in her food lab classes. The department encourages faculty, students, community members and everyone interested to participate in the garden project. “Anyone in the university can help if they’d like,” Mckeehan said. The garden project is also working with the campus food pantry by developing a recipe book that will explain how students can use the produce they take as ingredients. 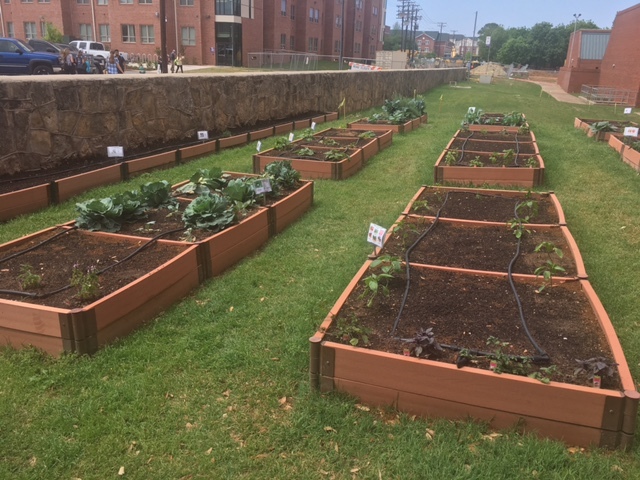 Mckeehan aims to make the sustainable garden a part of student life and a dependable tool for students and faculty to utilize.